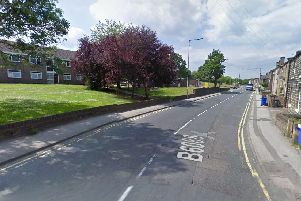 A car stolen from Rotherham crashed into a police car in Sheffield less than one hour later. The blue Volvo was one of two vehicles stolen after a burglary in the early hours of this morning. Less than one hour later it was spotted by officers in Sheffield and a police pursuit was mounted. The car was said to have been travelling along the Greenhill Parkway at an 'extremely high speed'. It was eventually stopped in Lowedges after it went the wrong way round a roundabout and crashed into a police car. Both occupants in the stolen car fled but one was tracked down and arrested on suspicion of burglary. A police search is still under way for the other. A South Yorkshire Police spokesman said: "A Volvo along with another vehicle was stolen from the Rotherham area in the early hours of this morning by way of a burglary. "Officers from roads policing, firearms support, local district and our colleagues from Derbyshire Constabulary went to look for the vehicles to see if they could be located. "The Volvo was sighted on Greenhill Parkway at extremely high speed. As it made off from officers it was involved in a collision with one of our roads policing vehicles, having decided to go the wrong way round a roundabout. "Both occupants after crashing into our colleague decided to run from the vehicle. "One of the suspects was swiftly detained and is now in our custody, the other remains outstanding. Enquiries are ongoing to locate this individual. "Our officer is shaken and a little sore but otherwise unharmed. "All this happened less than one hour after the Burglary occurred."